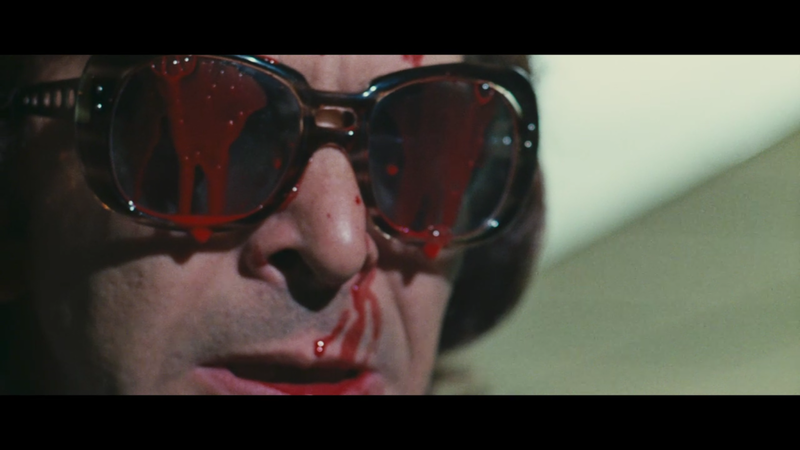 I think the addition of Corbucci might have sweetened the spices Midnight offered. He wrote the wacky, super police officer story SUPER FUZZ back in the day and I loved it. Midnight had more flavor and buzz with a plot that I found to be more interesting and engaging. Let's talk about it. 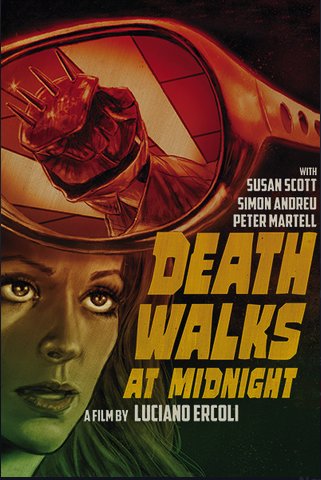 Now, don't get me wrong - I liked DEATH WALKS IN HIGH HEELS well enough. The plot is relatively simple. A woman's Father is involved in a diamond heist. He's out of the picture, but the diamonds are missing. Does his daughter know where they are? Maybe. And someone - a masked killer with striking blue eyes....wants her to tell where they are...or DIE! So, all that's working for me here, but honestly, the characters bored me to tears and the pace made me shake with desire to fast forward....which I did. And, Ms. Nieves Navarro is NOT a good dancer, so the first part of the film was rather painful for me there as well - watching this woman jerk around like she's having a seizure. We're treated to some good bully acting from Luciano Ercoli, the Director of both of these films AND Nieves' real life husband, as I found out. Rather cool. Here he's the boyfriend of Navarro and not 100% sweetheart. Sweethearts don't toss knives at their girlfriends. When the mysterious masked diamond hunter comes after Nicole and demands to know where the diamonds are, she decides that the advances of an admirer from the clubs she's performed in - a Dr. Robert Mathews (Frank Wolff) - seem pretty great and she runs off with him without a word to anyone. They have a grand time and Nicole is treated like a Queen as the Doctor buys her dresses and dinners and the two seem like they are made for each other. The Doc whisks her away to a cottage he owns in a small town and Nicole pretends to be his wife as they live life to the fullest - happy and content. Sure, the small village is filled with gossips and nutty people...including a strange man missing a hand, but I'm sure everything will work out for them. Again, all of that was great for a story perspective, however the pace made me CRAZY. We see them shopping....eating....exchanging cute banter with a local fish seller....making love....saying they'll miss each other when the Doctor has to fly back to London for a while, but it all takes WAY TOO DAMN LONG to deal with. There's just not enough story to support the run time for me. I felt like I was being dragged behind a very slow pony. 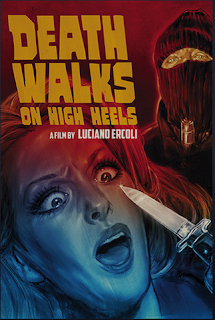 Ercoli's direction is great and the film does manage to wrap very nicely in true giallo style, but it just took to long to get there for me. And the exposition at the end.....whew. Pretty funny, really. 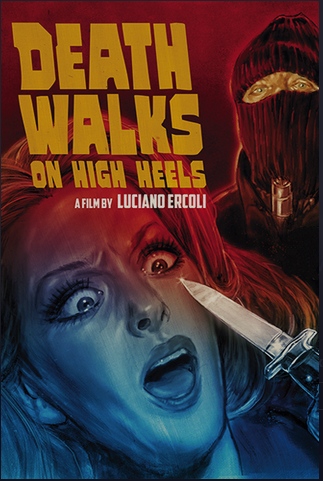 "Let me explain everything I did and why I did it...." DEATH WALKS ON HIGH HEELS might require me to re-watch at some point in the near future, but I'll start it in the middle for sure. Now, DEATH WALKS AT MIDNIGHT was a different viewing for me all together. Now this film really hit the mark for me. The pace, character interactions, and visuals were interesting, engaging, and fun. Nieves Navarro as Valentina is strong, confident, and doesn't take any crap from anyone. Simón Andreu is this magazine guy (always get him and Luciano Ercoli mixed up!) who manages to get Valentina fired from her job and exposed to the murdered after backing out on his promise to keep her masked and anonymous for this wacky drug experiment that kicks this who plot off. Their chemistry is fun to watch as they snip at each other and fight. Suuuuuuure, the main catalyst for the plot - a vision of a killer while under the influence of a drug - falls right into the WTF?! gialli plot nuttiness for sure, but it's really just used to get things rolling and get us involved in this murder situation. After that, it's cat-and-mouse with the killer (who we see right away) as he tries to silence Valentina. I loved watching this film. The banter was grand and natural, the characters were well rounded, and the pace was clipping right along from set piece to set piece. And, the mystery was interesting and really had me guessing. I'll watch this one again for sure. Have you seen these? The SHUDDER reviews put HEELS in a far better light than I've placed it - hence the planned rewatch. I'd love to hear what other people have to say about these films. Am I missing something? LET ME KNOW!